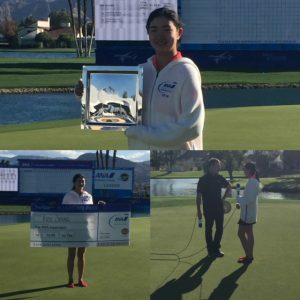 RANCHO MIRAGE, Calif. – Rose Zhang of Irvine, California, earned an exemption into the LPGA’s first major of the year, the ANA Inspiration, by winning the American Junior Golf Association’s ANA Junior Inspiration at Mission Hills Country Club. Zhang celebrated by jumping into Poppie’s Pond with 1996 ANA Inspiration champion Patty Sheehan who she competed with during the final round. Zhang posted a tournament total of 7-under-par 209 to edge out second-round leader Ashley Menne of Surprise, Arizona, for her first AJGA Invitational win. The 14-year-old was one of 11 players who qualified for the ANA Junior Inspiration as a representative of one of All Nippon Airways’ North American Gateway Cities. As a Gateway City Qualifier, Zhang donated a $5,000 Gateway City Grant from ANA to the Southern California Golf Association’s junior golf program. In the past two years, ANA has donated $110,000 to state and local golf associations through the Gateway City Grant program. Zhang earned her victory in dramatic fashion, birdying No. 18 of the Dinah Shore Tournament Course to seal her victory. At No. 8 in the Rolex AJGA Rankings, Zhang won the 2017 Junior PGA Championship. The 14-year-old was also the 2017 recipient of an Achieving Competitive Excellence (ACE) Grant for financial assistance from the AJGA on behalf of ANA. Menne took second, her best AJGA Invitational finish, at 6-under-par 210. Three-time Rolex Junior All-American Yujeong Son of (South Korea) Norman, Oklahoma, finished third with a 54-hole total of 5-under-par 211. Amari Avery of Riverside, California, posted a 4-under-par 212 to finish fourth. Rachel Heck of Memphis, Tennessee, the AJGA’s reigning Rolex Junior Player of the Year, rounded out the top five at 1-under-par 215. During the final round, juniors were paired with LPGA Legends. Each pairing group featured one Legend and two juniors. Juniors competed for the stroke-play title and participated in a fun competition among groups in a best-ball format with the Legends. Liselotte Neumann, 1988 U.S. Women’s Open champion, Kynadie Adams of Gallatin, Tennessee, and Hailey Borja of Lake Forest, California, took home the best-ball prize at 10-under-par 62. 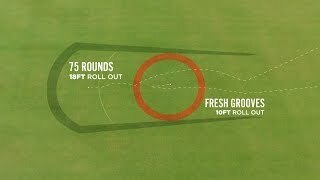 The ANA Junior Inspiration, organized in partnership between the AJGA and ANA, annually challenges 48 AJGA invitation-only golfers for 54 holes of golf. The ANA Junior Inspiration is celebrating its second year on the AJGA schedule. Prior to its association with the AJGA, the ANA Junior Inspiration operated as an 18-hole qualifier for Southern California-based juniors to earn a spot into the major championship field.